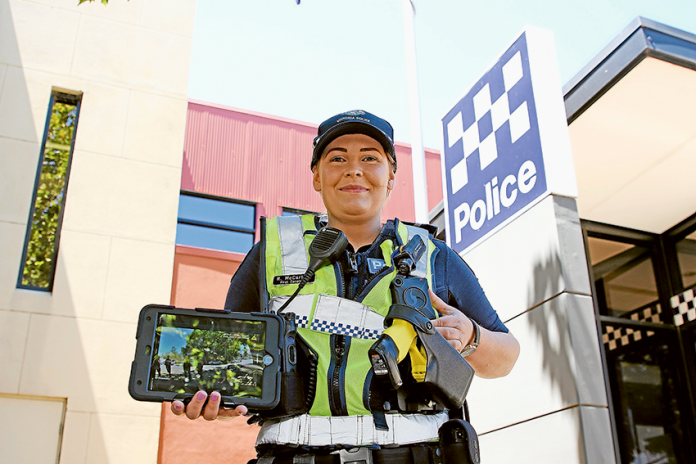 SAFER MEMBERS AND COMMUNITY… Shepparton Police first constable Rechelle McCartney is one of 150 local officers ranked sergeant and below who will be wearing a new personalised body camera. Photo: David Lee. ONE hundred and fifty local police officers have begun training in a new piece of technology that is set to help make the streets and themselves safer, with body worn cameras now in operation around the region. Officers ranked sergeant and below from Shepparton, Dookie, Mooroopna, Murchison and Tatura will now be wearing the personalised cameras that will live stream at all times, meaning members have the ability to capture recordings of incidences which are required for evidentiary purposes or for justified circumstances at the discretion of the members. 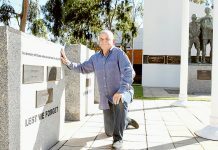 Shepparton Police Service Area local area commander, Inspector Troy Hargadon said, “This is a great initiative and provides an opportunity to enhance our safety, our community’s safety and get better outcomes for our vulnerable groups of victims and witnesses of crime. “The footage we can get from these cameras will prevent victims from having to attend court and help to expedite things such as outcomes of court matters…it just takes the angst and the stress out of that for those who are unfortunately victims of crime or witnesses of crime. More than 11,000 general duties police and Protective Services Officers are set to be equipped with the cameras across the state by 2020.